As a person who works on my phone during my commutes to write news and stories, I have always batted around the idea of picking up a BlackBerry with a keyboard. 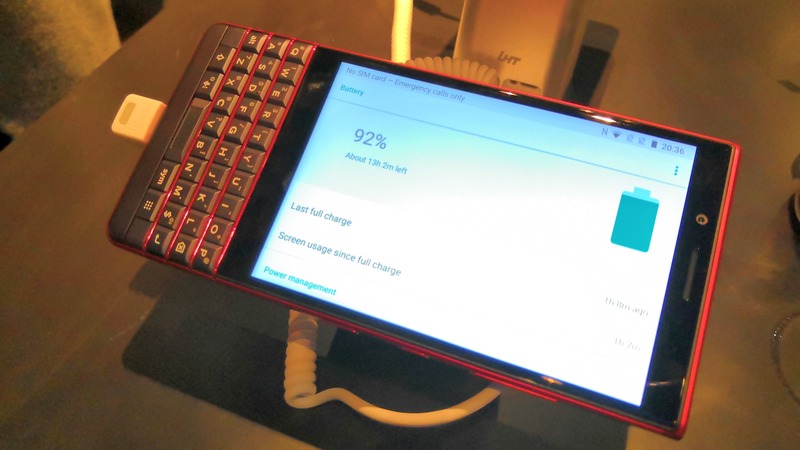 The BlackBerry name is synonymous with devices that offer a fully functional physical keyboard with the display, something that is very unique in this era of touchscreen-everything. But for multiple reasons, it has never worked out. Slowly but surely, however, the company is finally starting to meet those requests. Does anyone else want a fully functional up-to-date Android device, with a keyboard, and a device that is nice to hold? If so, then the Key2 LE may catch your eye. So to start, I did have some hands-on time with the KEYone last year. It was a sizeable device, but it didn’t fit quite right in my hands. BlackBerry then released its new flagship, the Key2, in June 2018, and in the process refined it from many angles, both with regard to design and internals. Most recently, BlackBerry this month announced the Key2 LE, a cheaper variant of its Key2 that is even thinner and lighter (see the details in the table below). Meanwhile its keyboard has a slight indented angle to the center, allowing users familiar with the layout to find their position easily. The highlight of the Key2 LE is certainly its design, in particular the Atomic Red color version and its red frets across the keyboard. Rather than being a single piece of chassis, the frets look separate and really bring the look together. 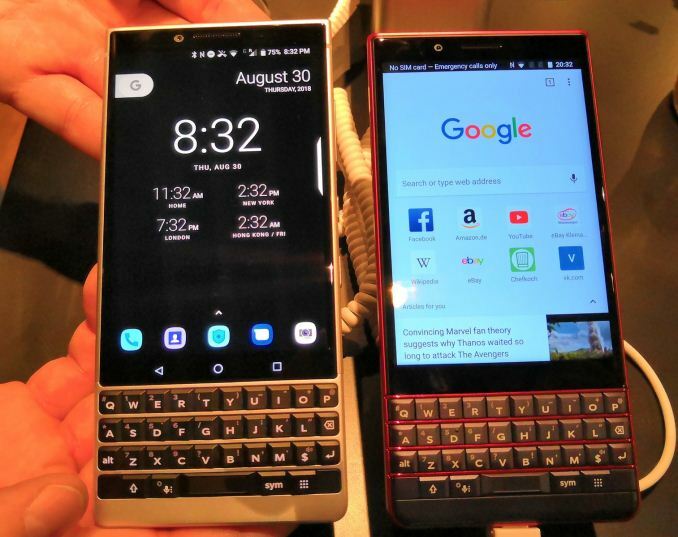 BlackBerry is known for its business-focused devices and security, so while most business users will be going after the ‘Slate’ color, most of the press at IFA this year were fixated on the Champagne and Atomic Red designs. In terms of software, the device a full-fledged Android phone, with the Play Store and BlackBerry-specific applications such as BBM. Even though my thoughts go back to the BB executive whom once said ‘we have the Google’, for anyone that had qualms about using Android on BlackBerry, the integration appears to be solid. The Key2 LE will ship with Oreo 8.1 as its base, with Pie 9.0 coming at a later date. What users from non-BB devices might not get used to is the screen size. Having a physical keyboard eats up some of that real-estate, and the BlackBerry KEY-series phones only have a 4.5-inch display as a result. The with that said, the 1080x1620 resolution hides an extremely respectable pixel density of 432 pixels per inch, similar to most flagships, and that resolution is actually a 3:2 aspect ratio (or 2:3 because the vertical is longer). By equipping all three KEY phones - the KEYone, the Key2, and the Key2 LE - with essentilly the same LCD, BlackBerry ensures that they all provide a similar user experience and eliminates any need to customize its BBM software for particular KEY models. The new Key2 and Key2 LE smartphones are based the Snapdragon 660 and 636 SoCs (respectively), featuring four high-performance Kryo Gold cores and four low-power Kryo Silver cores. This provides considerably higher performance than their predecessor, the KEYone, which was powered by the Snapdragon 625 SoC and its eight low-power Cortex-A53 cores. The more expensive Key2 comes with 6 GB of LPDDR4 and 64 or 128 GB of storage, whereas the Key2 LE is equipped with 4 GB of DRAM (already better than the default KEYone) as well as 32 or 64 GB of NAND. A microSD card slot is present, and dual SIM models will be available. 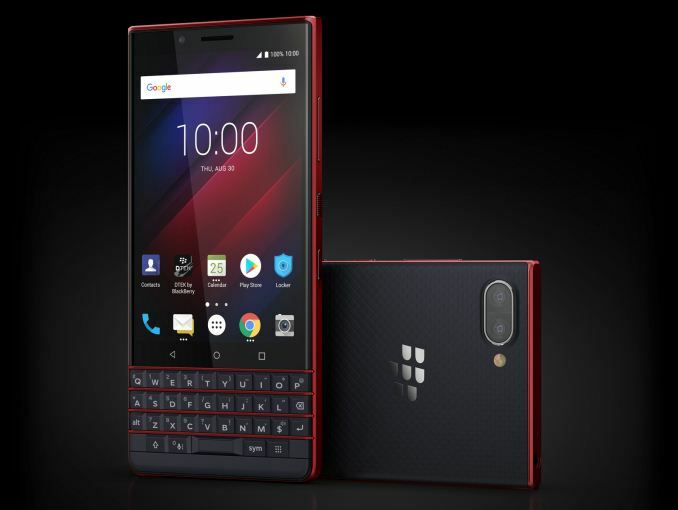 Other features on the Key2 LE device include a fingerprint sensor in the spacebar, 802.11ac dual-band Wi-Fi, a 3000 mAh battery with Quick Charge 3.0, a 3.5mm audio jack, and a USB Type-C port. For cameras, the rear of the phone has a dual camera setup combining a 13MP f/2.2 wide-angle camera with a 5MP f/2.4 telephoto camera for zoomed shots, while the front-facing camera is an 8MP fixed focus unit. BlackBerry states that the rear cameras can record up to 4K30 with HDR. By contrast, the flagship Key2 has a larger battery and better cameras (see the table below for details). One of the additional things I stated when handling the device was that it felt light when I first picked it up. It did feel really light, but I’m honestly not sure if that’s because I was expecting it to be heavy with a keyboard – compared to some of my other phones, it is basically the same – but it was lighter than I expected. 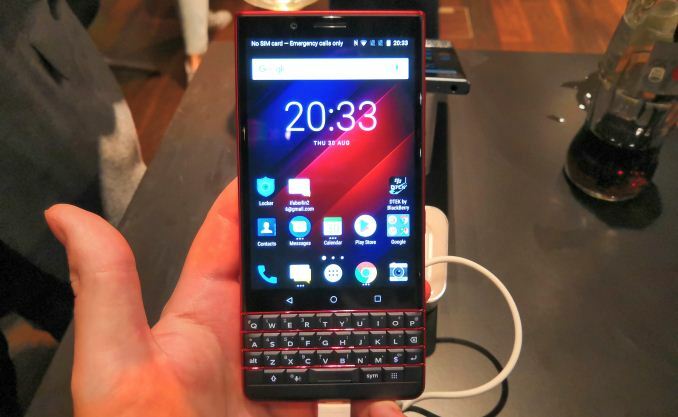 BlackBerry promotes the Key2 LE as its thinnest smartphone to date, and will be available from September. The 32GB version is set to retail for $400. ** The official styling is KEY2 LE. Our style guide calls for Key2 LE. Personally I think it looks better. Dimensions Height: 151.4 mm | 5.96"
Width: 71.8 mm | 2.83"
Thickness: 8.5 mm | 0.33" Height: 150.3 mm | 5.92"
Thickness: 8.4 mm | 0.33" Height: 149.1 mm | 5.87"
Width: 72.4 mm | 2.85"
Thickness: 9.4 mm | 0.37"
I would love to try one out. My phone use is 75% email and 25% sms/slack/twitter. I don't watch movies or play games on my phone and I'm very curious how much better I could type on a keyboard. And that’s where you are wrong. I loved my q10 but the hardware keyboard exacerbated my carpal tunnel. swiping can happen forever, even beyond general virtual keypresses. it's the fastest, more comfortable way to type in my experience. A keyboard is hands down the fastest and most comfortable way to write anything extensive on a phone. Every OEM uses touchscreen keyboards these days, because it’s the least worst solution for basic writing, and because most users don’t write all that much: An email or two, entering a URL or a password.